Crash-landing on Jakku after escaping The Finalizer, rebellious Stormtrooper FN-2187 fears his newfound Resistance friend dead. But Poe Dameron survived to fight another day, and the latest Lego Star Wars: The Force Awakens DLC explains how. It’s pretty dumb. 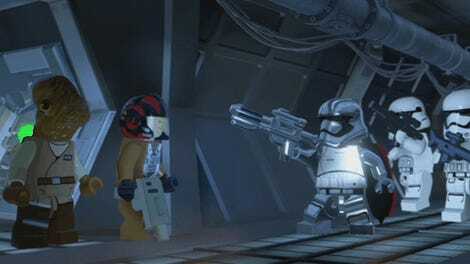 There was much hyping of the special missions in Lego Star Wars: The Force Awakens and how they would fill in gaps and lore the movie didn’t touch. Some of them, like Rathtar Hunting with Han Solo or finding out how C3-PO got his red arm, are pretty great. The one I was most looking forward to however, was the DLC showing how Poe Dameron survived the crash on Jakku. Was he swallowed by the sand and forced to survive a harsh underground environment? Did he somehow eject before impact? Nothing quite so exciting. It turns out Finn is just really bad at rescuing people. I mean yeah, comedy, but still. Basically left for dead while Finn runs off to hang out with his platonic soulmate, Poe must struggle to . . .
That’s the luck of the incredibly handsome and charming for you. Okay, an alien finds him. A nice alien, who is more than willing to take Poe to his village to call for pickup. The developers try to make Poe’s “Quest” for survival exciting. There’s a short vehicle chase in which Poe and his new friend must escape from raiders. Then the pair must liberate the village from those same raiders, which involves both a single multi-build puzzle and a cover shooting sequence with ten whole enemies to dispatch. Ultimately it’s all padding, and not a whole lot of it. The entire mission, which cost $2.99 (free to season pass holders), was over in about 12 minutes. That’s the whole thing in the video atop the post. I suppose I shouldn’t have expected too much adventure and excitement in a level bridging a movie gap for a character that was originally supposed to die. Still, this is kind of silly and sad. At least it’s not console exclusive? Update 10/6: As sister site Io9 points out, the explanstion here pretty much mirrors what was featured in the novelization of The Force Awakens, because some people read novelizations.